Our very first gold bullion investment advice is to set aside no more than 5 or 10% of your entire portfolio for purchasing gold bullion bars and coins. When choosing which gold bullion bars or coins to purchase, stick to well known bullion products that come with relatively low investment costs. Gold bullion bars carry lower premium fees than coins, however, they are somewhat harder to sell unless they come with assay certificates attached like Credit Suisse or PAMP Suisse gold bullion bars. If you are determined to focus on bullion coins due to their superior liquidity, consider 22 karat South African Krugerrands or 24 karat Canadian Gold Maple Leaf coins. These particular coins come with somewhat lower dealer mark ups compared to other popular gold bullion coins available on the market. According to our second gold bullion investment advice, when to buy is also very important because you definitely need to avoid buying when the spot price of gold is in its highest range in decades. Generally, savvy investors buy when the prices of gold are low and that’s usually in favorable economic environment. 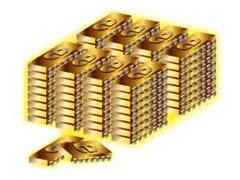 The last but not least gold bullion investment advice has to do with physical bullion storage. You can store your gold at your local bank’s safe deposit box or you can inquire if your trustworthy gold bullion dealer will do it for you. For example, Bullion Vault will not only sell or buy back your gold bullion bars, it will store them for you at their secure vault infrastructure located in London, Zurich and New York for a fraction of the cost. However, our gold bullion investment advice does not focus exclusively on physical gold purchases, but on other alternative gold investment mechanisms like gold ETF’s, for example. Read our other articles on the website where we suggest which best gold investment company to consider for your portfolio.